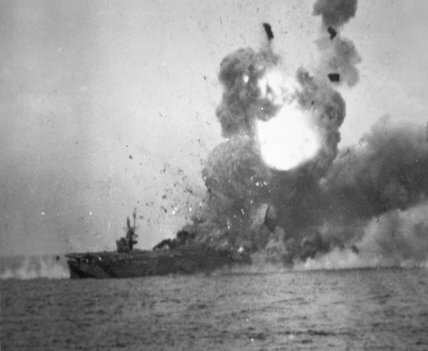 I am still taking some time off from writing about politics and so today I am posting the third article of a series on the Battle of Leyte Gulf. This article discusses the Battle of Surigao Strait which ended in the near annihilation of most of the of the Japanese Southern Force. The battle was the last ever where battleships engaged each other in a surface action. 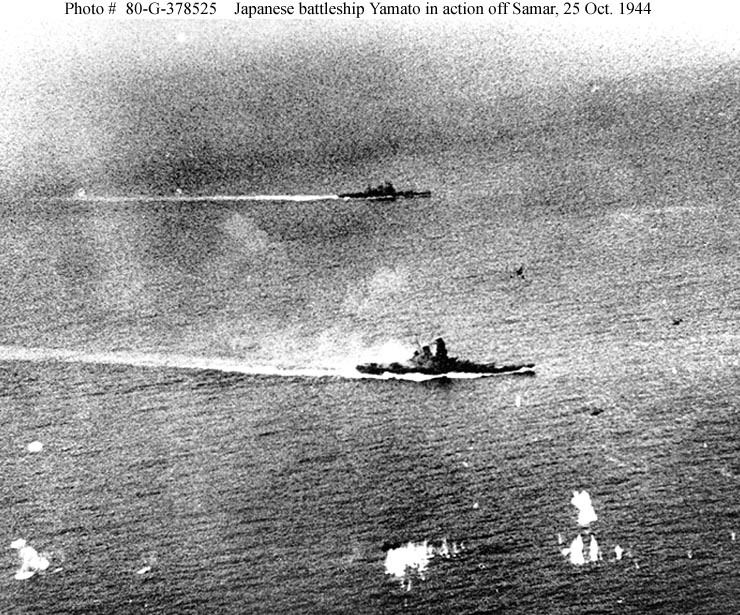 The two task groups of the Japanese Southern Force passed the daylight hours of 24 October relatively unscathed despite an air attack that caused minor damage. 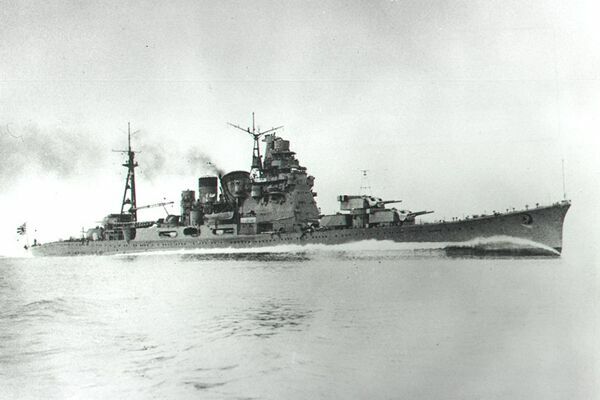 The group commanded by Vice Admiral Shoji Nishimura comprised of the elderly Battleships Yamashiro and Fuso the Heavy Cruiser Mogami and four destroyers was leading the charge and was followed by that commanded by Vice Admiral Kiyohide Shima with the Heavy Cruisers Nachi and Ashigara, Light Cruiser Abukuma and four destroyers. 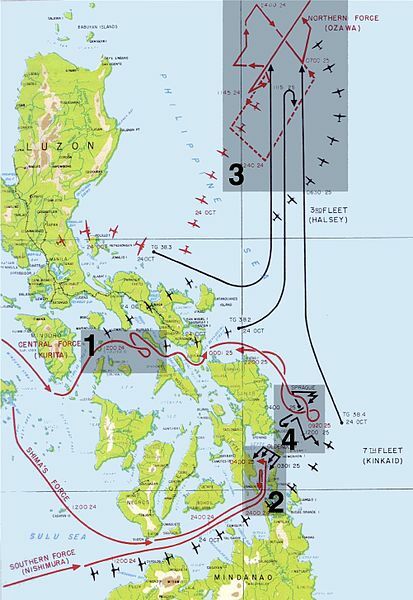 The mission of these two groups which were unable to coordinate their actions due to orders to maintain strict radio silence was to fight their way through the Surigao Strait to assist the Central Force in destroying the US invasion force in Leyte Gulf. The mission was for all practical purposes a suicide mission, a naval “Charge of the Light Brigade” as they sailed into the Valley of Death against the Battle Line of the US 7th Fleet. The Japanese Battleships had spent the majority of the war in home waters and had seen little action. They had not been part of any of the great Japanese victories in 1941 and 1942 and they had not been blooded in the Solomons. Instead the two elderly battlewagons passed the war conducting training in the inland sea. They were no longer first line ships but the Japanese were desperate. During the afternoon Admiral Nishimura received an accurate report from one of Mogami’s scout planes telling him exactly what he was up against yet he pushed on in the manner of a Samurai. Facing him was a force built around the 6 old Battleships of Vice Admiral Jesse Oldendorf’s 7th Fleet Battle Line. The Americans heavily outnumbered the Japanese, the Battleships West Virginia, California and Tennessee were the heart of the force. Fully modernized after Pearl Harbor they no longer resembled the ships that they were before the war. Equipped with the latest Mark 8 Fire Control radar they had the ability to put their 16” and 14” shells on target at ranges farther than anything that the Japanese could counter. Joined by the less fully modernized Maryland, Mississippi and Pennsylvania, 4 Heavy Cruisers, 4 Light Cruisers, 28 Destroyers and 39 PT Boats the outnumbered the combined Japanese forces with sixteen 16” and forty eight 14” guns to twenty 14” guns on the antiquated Yamashiro and Fuso. The disparity in lesser guns was just as stark, thirty five against twenty six 8” guns, and fifty one 6” guns against six 5.5 inch guns. This massive imbalance didn’t count the nearly one hundred fifty 5” guns on the US destroyers and as well as nearly 200 torpedo tubes. Nishimura’s force entered the southern entrance to Surigao Strait and was discovered by the American PT Boats at about 2236. Though the PTs scored no hits they provided critical updates on the Japanese to Oldendorff. At 0300 the American destroyers began a devastating series of attacks on the Japanese flanks. They sank two destroyers and damaged another which had to turn back, but the real damage occurred when both Fuso and Yamashiro were hit. Fuso took two torpedoes fired by the destroyer USS Melvin. She slowed and then blew up and broke in two sinking with all hands. This account has been contested in recent years but many find the new version less believable than the first. Key in the evidence was the rescue and capture of Yamashiro’s Executive Officer in the north end of the strait and the surviving logs of the other Japanese ships which reported the sinking. Yamashiro though hit continued north with Mogami and the last destroyer Shigure. At 0353 West Virginia opened fire and score hits on her first salvo. She was joined by California and Tennesseeat 0355, the other battleships with their Mark 3 fire direction radars were slow to open up. Maryland got off six full salvos by ranging in on the splashes of West Virginia, California and Tennessee. Mississippi logged the final salvo of the battle and Pennsylvania got no shots off. West Virginia fired 16 salvos, 96 round of 16”armor piercing shells, Tennessee got off 69 rounds and California 63 each of 14” armor piercing shells, while Maryland added another forty eight 16” rounds. The Yamashiro and Mogami sailed into the maelstrom absorbing hit after hit and gamely fought back. Yamashiro hit the destroyer Albert W Grant which was also hit by friendly fire badly damaging her. 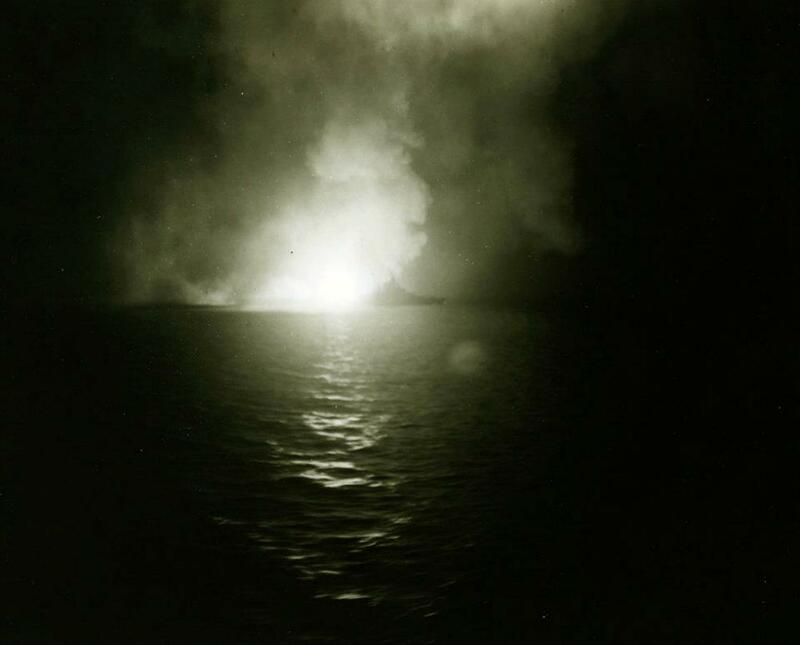 Finally both ships ablaze they turned back down the strait with Yamashiro sinking with few survivors at 0420. Shima’s force entered the fray and the Light Cruiser Abukuma was damaged by a torpedo fired by PT-137 and fell out of the formation. She was sunk on 26 October by Army Air Force B-24s. As Shima came up the strait his force entered the battered remnants of Nishimura’s force, the burning halves of Fuso and the retreating Mogami and Shigure. Assuming the halves of Fusoto be the wreckage of both battleships Shima beat a hasty retreat but in the process his flagship Nachi collided with Mogami flooding Mogami’s steering engine room and leaving her crippled. She was attacked again by American cruisers and aircraft and as abandoned at 1047 and scuttled a torpedo from the destroyer Akebono sinking at 1307 on 25 October. 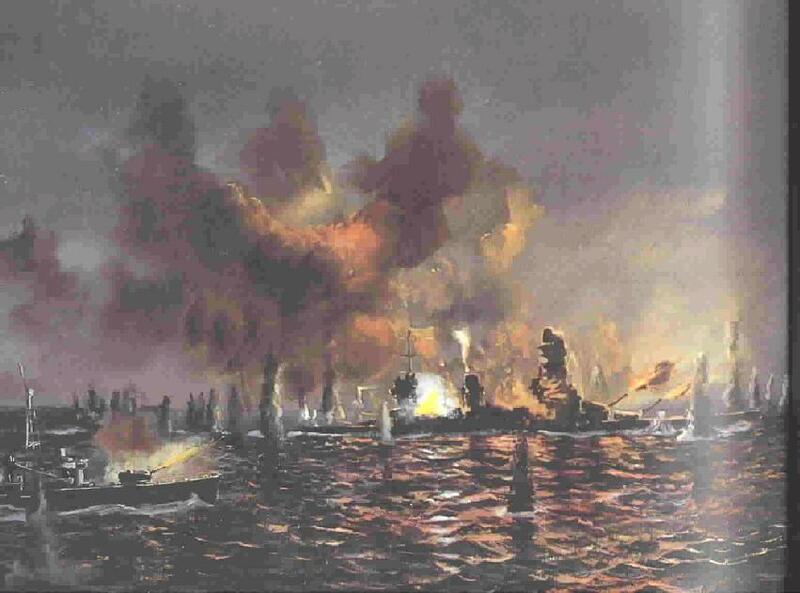 The battle was one of the most lopsided surface engagements of the war. When it was over only one of Nishimura’s ships had survived the “lucky” Shigure. Shima’s force survived the night but most of his ships were sunk in the following by war’s end. 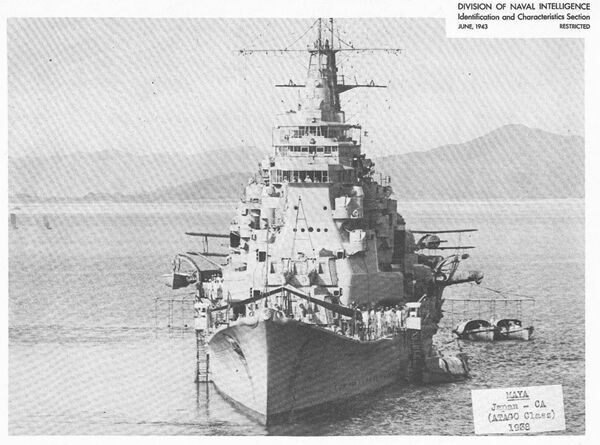 Nachi was sunk in Manila Bay on 5 November by aircraft from the USS Lexington with a loss of over 800 sailors while Shima was in a conference ashore. With the exception of Albert W Grant and a PT Boat the American force was unscathed the old Battlewagons dredged from the mud of Peal Harbor had led the fleet to a decisive victory in the last duel between Dreadnaughts ever fought. The Japanese died as Samurai trying to complete a hopeless mission against a far superior force. 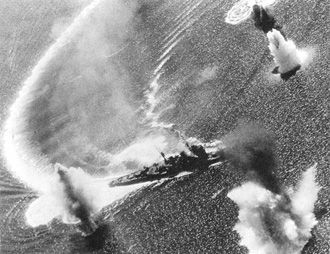 I am still taking some time off from writing about the Presidential race and so today I am posting the third article of a series on the Battle of Leyte Gulf. 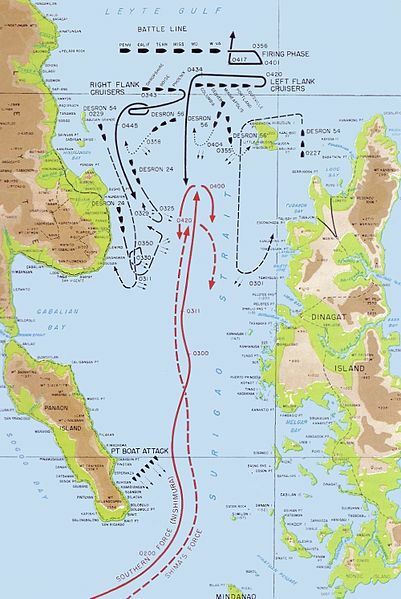 This article discusses the Battle of Surigao Strait which ended in the near annihilation of most of the of the Japanese Southern Force. The battle was the last ever where battleships engaged each other in a surface action. Nishimura’s force entered the southern entrance to Surigao Strait and was discovered by the American PT Boats at about 2236. Though the PTs scored no hits they provided critical updates on the Japanese to Oldendorff. At 0300 the American destroyers began a devastating series of attacks on the Japanese flanks. They sank two destroyers and damaged another which had to turn back, but the real damage occurred when both Fuso and Yamashiro were hit. Fuso took two torpedoes fired by the destroyer USS Melvin. She slowed and then blew up and broke in two sinking with all hands. This account has been contested in recent years but many find the new version less believable than the first. Key in the evidence was the rescue and capture of Yamashiro’s Executive Officer in the north end of the strait and the surviving logs of the other Japanese ships which reported the sinking. Yamashiro though hit continued north with Mogami and the last destroyer Shigure. At 0353 West Virginia opened fire and score hits on her first salvo. She was joined by California and Tennessee at 0355, the other battleships with their Mark 3 fire direction radars were slow to open up. Maryland got off six full salvos by ranging in on the splashes of West Virginia, California and Tennessee. Mississippi logged the final salvo of the battle and Pennsylvania got no shots off. West Virginia fired 16 salvos, 96 round of 16”armor piercing shells, Tennessee got off 69 rounds and California 63 each of 14” armor piercing shells, while Maryland added another forty eight 16” rounds. The Yamashiro and Mogami sailed into the maelstrom absorbing hit after hit and gamely fought back. Yamashiro hit the destroyer Albert W Grant which was also hit by friendly fire badly damaging her. 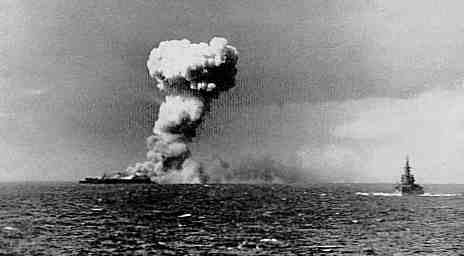 Finally both ships ablaze they turned back down the strait with Yamashiro sinking with few survivors at 0420. Shima’s force entered the fray and the Light Cruiser Abukuma was damaged by a torpedo fired by PT-137 and fell out of the formation. She was sunk on 26 October by Army Air Force B-24s. As Shima came up the strait his force entered the battered remnants of Nishimura’s force, the burning halves of Fuso and the retreating Mogami and Shigure. Assuming the halves of Fuso to be the wreckage of both battleships Shima beat a hasty retreat but in the process his flagship Nachi collided with Mogami flooding Mogami’s steering engine room and leaving her crippled. She was attacked again by American cruisers and aircraft and as abandoned at 1047 and scuttled a torpedo from the destroyer Akebono sinking at 1307 on 25 October. Under three years after the Japanese attack on Pearl Harbor five of the six surviving battleships fought in the last battleship versus battleship engagement in history, taking revenge on a Japanese surface force at the Battle of Surigao Strait during the Battle of Leyte Gulf. 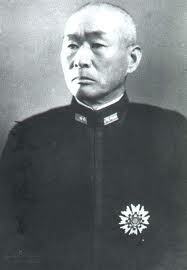 Vice Admiral Shoji Nishimura who commanded the Southern Force of the Japanese fleet attempting to defeat the American invasion force at Leyte Gulf had successfully avoided damage from the air attacks that so damaged he Center Force sinking the massive Super-Battleship Musashi. Now his force steamed into Surigao Strait in the hopes that it could break through any American resistance and destroy the transports laden with troops and supplies in Leyte Gulf. Following a short distance behind Nishimura was the force of Vice Admiral Kiyohide Shima. The two forces were composed of two battleships, three heavy and two light cruisers and eight destroyers. They had no idea that they were sailing into a maelstrom of death. The mission of these two groups was to fight their way through the Surigao Strait to assist the Central Force in destroying the US invasion force in Leyte Gulf. The mission was for all practical purposes a suicide mission, a naval “Charge of the Light Brigade” as they sailed into the Valley of Death against the Battle Line of the US 7th Fleet. The two Japanese Battleships, the Fuso and Yamashiro had spent the majority of the war in home waters and had seen little action. They had not been part of any of the great Japanese victories in 1941 and 1942 and they had not been blooded in the Solomons. Instead the two elderly battlewagons passed the war conducting training in the inland sea. They were no longer first line ships, but the Japanese were desperate and every capital ship mattered, even an old battleship set loose among helpless transports could wreak havoc. During the afternoon of October 24th Admiral Nishimura received an accurate report from one of Mogami’s scout planes telling him exactly what he was up against yet he pushed on in the manner of a doomed but resolute Samurai. 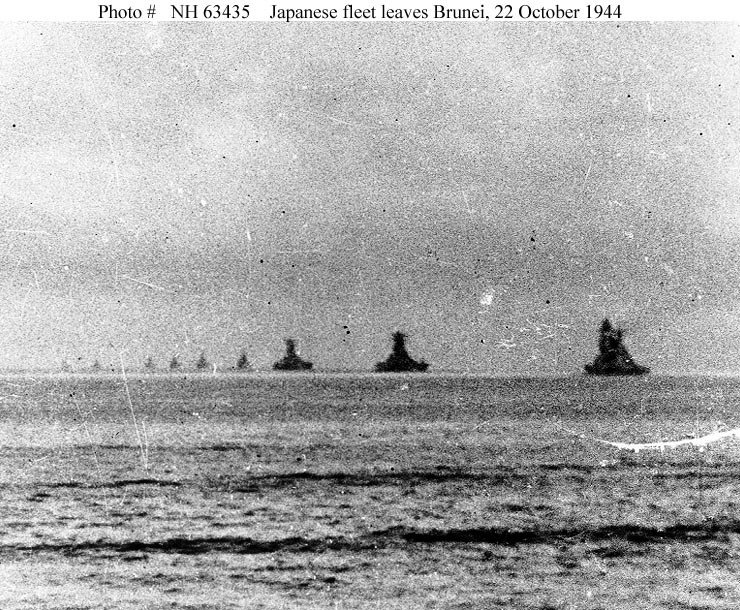 Facing Nishimura and Shima was a force built around the six old Battleships of Vice Admiral Jesse Oldendorf’s 7th Fleet Battle Line, five of which had been resurrected from the hell of Pearl Harbor. 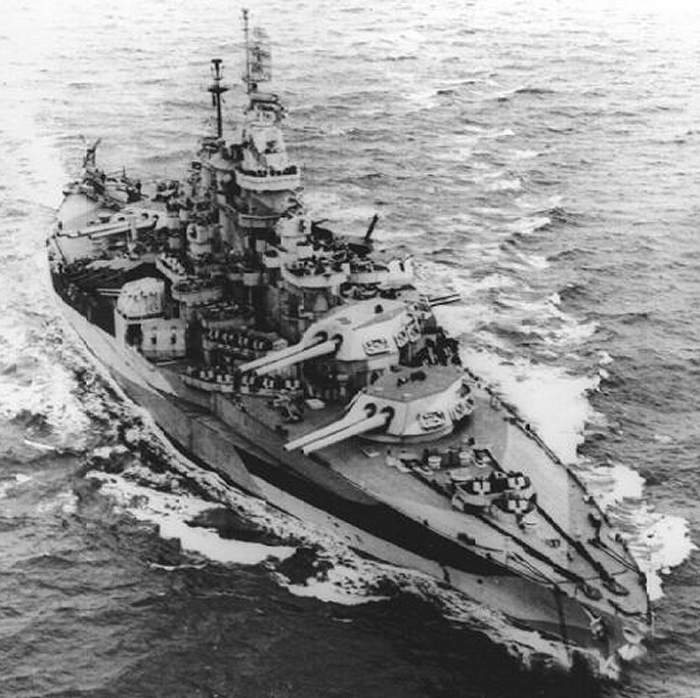 The Americans heavily outnumbered the Japanese, the Battleships USS West Virginia, USS California and USS Tennessee were the heart of the force. Fully modernized after Pearl Harbor they no longer resembled the ships that they were before the war. Equipped with the latest Mark 8 Fire Control radar they had the ability to put their 16” and 14” shells on target at ranges farther than anything that the Japanese could counter.The were in most respects, especially in gunpowder and fire control as modern as the newest battleships in the fleet, and far superior to all Japanese battleships except the great Yamato and now departed Musashi. These three battlewagons were joined by the less fully modernized USS Maryland, USS Mississippi and USS Pennsylvania. 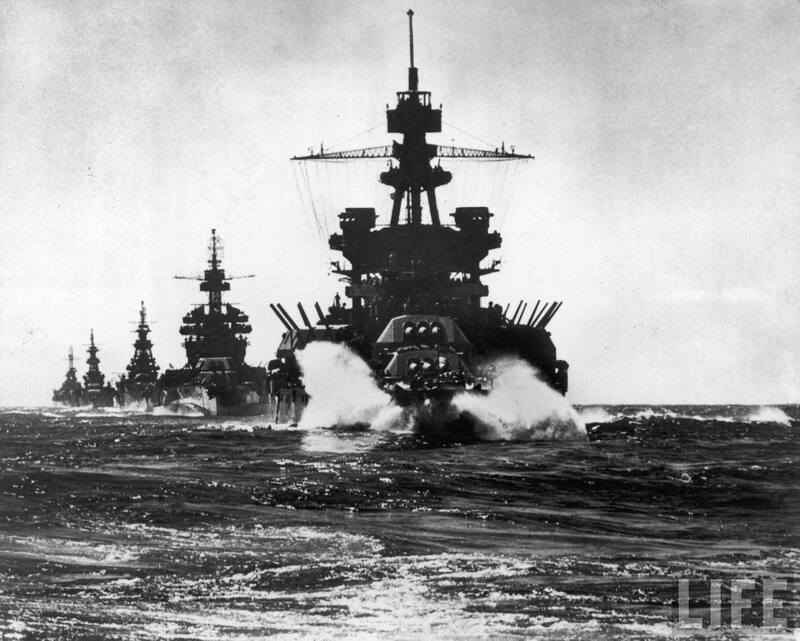 The American task force included 4 Heavy Cruisers, 4 Light Cruisers, 28 Destroyers and 39 PT Boats. In the shear number of guns the six American battleships outnumbered the combined Japanese forces with sixteen 16” and forty eight 14” guns against twenty 14” guns mounted on the antiquated Yamashiro and Fuso. The disparity in lesser guns mounted on the cruisers and destroyers was was just as stark; thirty five against twenty six 8” guns, and fifty one 6” guns against six 5.5 inch guns. This massive imbalance didn’t count the nearly one hundred fifty 5” guns on theUS destroyers and as well as nearly 200 torpedo tubes mounted on those ships as well as those on the PT Boats. When Nishimura’s force entered the southern entrance to Surigao Strait they were immediately discovered by the American PT Boats at about 2236. Though the PTs scored no hits they provided critical updates on the Japanese position and movements to Jesse Oldendorff. At 0300 the American destroyers began a devastating series of attacks on the Japanese flanks. They sank two destroyers and damaged another which had to turn back, but the real damage occurred when both Fuso and Yamashiro were struck by torpedoes. Fuso took two torpedo hits from fish launched by the destroyer USS Melvin. Fuso slowed and then blew up and broke in two sinking with all hands. This account has been contested in recent years but many find the new version less believable than the first. 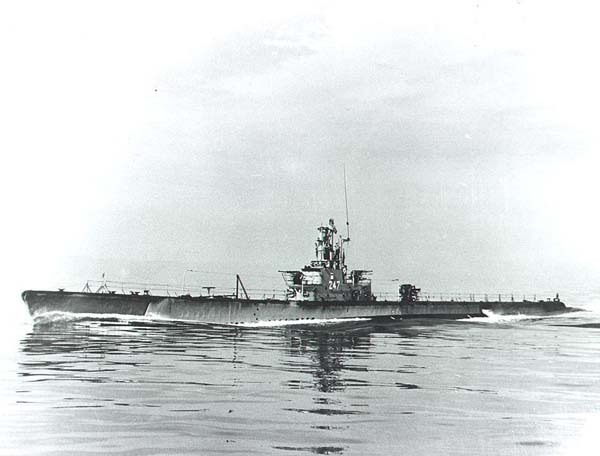 Key in the evidence was the rescue and capture of Yamashiro’s Executive Officer in the north end of the strait combined with the surviving logs of the other Japanese ships which reported the sinking of Fuso. The Yamashiro continued ahead, though hit in the destroyer attack continued north into the valley of death with heavy cruiser Mogami and the last remaining destroyer Shigure. At 0353 the West Virginia opened fire and scored hits on her first salvo. She was joined by California and Tennessee two minutes later, while the other battleships with their antiquated Mark 3 fire direction radars were slow to open up. Maryland got off six full salvoes by ranging in on the splashes of West Virginia, California and Tennessee. Mississippi logged the final salvo of the battle and Pennsylvania got no shots off. West Virginia fired 16 salvoes or 96 rounds of 16”armor piercing shells, Tennessee got off 69 rounds and California 63 of 14” armor piercing shells, Maryland added forty eight 16” rounds. The Yamashiro and Mogami sailed into the maelstrom absorbing hit after hit and gamely fought back. Yamashiro hit the destroyer USS Albert W Grant which was also hit by friendly fire badly damaging her. Finally with both of the Japanese ships ablaze they turned back down the strait in an attempt to escape this nautical version of Hell. Yamashiro did not survive long, sinking with few survivors at 0420. Shima’s force entered the fray and the Light Cruiser Abukuma was damaged by a torpedo fired by PT-137 and fell out of the formation. She was sunk on 26 October by Army Air Force B-24s. Shima and his force came up the strait his force encountered the battered remnants of Nishimura’s force, the burning halves of Fuso and the retreating Mogami and Shigure. 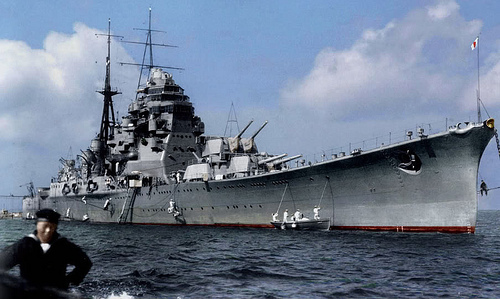 Assuming the halves of Fuso to be the wreckage of both battleships Shima beat a hasty retreat but in the process his flagship, the heavy cruiser Nachi collided with Mogami flooding Mogami’s steering engine room and leaving her crippled. She was attacked again by American cruisers and aircraft and was abandoned at 1047 and scuttled a torpedo from the destroyer Akebono. Her hulk sank at 1307 on 25 October. The battle was one of the most lopsided surface engagements of the war. When it was over only one of Nishimura’s ships had survived, the “lucky” Shigure. Shima’s force survived the night but most of his ships were sunk in the following months. 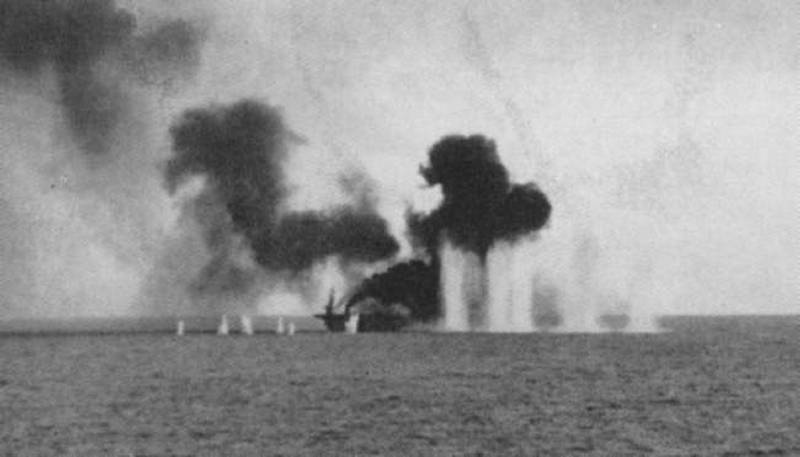 Nachi was sunk in Manila Bay on 5 November by aircraft from the USS Lexington with a loss of over 800 sailors while Shima was in a conference ashore. With the exception of the Albert W Grant and a PT Boat the American force was unscathed. The resurrected Battlewagons dredged from the mud of Peal Harbor had led the fleet to a decisive victory in the last duel between Dreadnaughts ever fought. The Japanese died as Samurai trying to complete a hopeless mission against a far superior force. The tide had turned and the Old Ladies of Pearl Harbor had returned from the dead to take revenge on the Imperial Navy. It was an irony of of the naval war that the old battleships; ships which had been regulated to the secondary duty of protecting invasion forces and conducting shore bombardments in support of amphibious operations fought the final battleship versus battleship engagement in history. Sadly none of the surviving Pearl Harbor survivors were preserved. Pennsylvania was expended as a target during the atomic bomb tests at Bikini Atoll, while West Virginia, Maryland, California and Tennessee were scrapped in the late 1950s and early 1960s. Mississippi, which was not at Pearl Harbor survived as a gunnery trainer into the late 1950s, and served as a test ship for the first generations of guided missiles before she too was scrapped. This is the third article of a series on the Battle of Leyte Gulf. 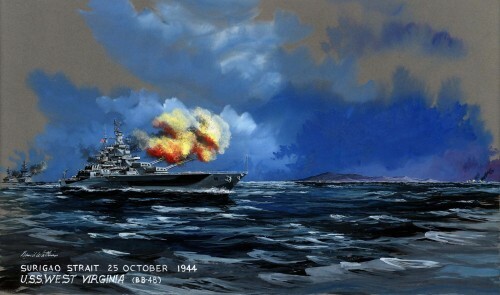 The Battle of Surigao Strait was the third action of the Battle of Leyte Gulf which ended in the near annihilation of one of the two groups of the Japanese Southern Force. The battle was the last ever where battleships engaged each other in a surface action. 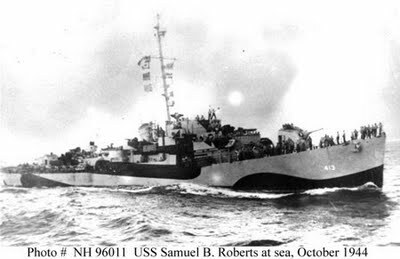 The mission of these two groups which were unable to coordinate their actions due to orders to maintain strict radio silence was to fight their way through the SurigaoStraitto assist the Central Force in destroying the USinvasion force in Leyte Gulf. The mission was for all practical purposes a suicide mission, a naval “Charge of the Light Brigade” as they sailed into the Valley of Death against the Battle Line of the US 7th Fleet. Facing him was a force built around the 6 old Battleships of Vice Admiral Jesse Oldendorf’s 7th Fleet Battle Line. The Americans heavily outnumbered the Japanese, the Battleships West Virginia, California and Tennessee were the heart of the force. Fully modernized after Pearl Harbor they no longer resembled the ships that they were before the war. Equipped with the latest Mark 8 Fire Control radar they had the ability to put their 16” and 14” shells on target at ranges farther than anything that the Japanese could counter. Joined by the less fully modernized Maryland, Mississippi and Pennsylvania, 4 Heavy Cruisers, 4 Light Cruisers, 28 Destroyers and 39 PT Boats the outnumbered the combined Japanese forces with sixteen 16” and forty eight 14” guns to twenty 14” guns on the antiquated Yamashiro and Fuso. The disparity in lesser guns was just as stark, thirty five against twenty six 8” guns, and fifty one 6” guns against six 5.5 inch guns. This massive imbalance didn’t count the nearly one hundred fifty 5” guns on theUS destroyers and as well as nearly 200 torpedo tubes. Nishimura’s force entered the southern entrance to Surigao Strait and was discovered by the American PT Boats at about 2236. Though the PTs scored no hits they provided critical updates on the Japanese to Oldendorff. At 0300 the American destroyers began a devastating series of attacks on the Japanese flanks. They sank two destroyers and damaged another which had to turn back, but the real damage occurred when both Fuso and Yamashiro were hit. Fuso took two torpedoes fired by the destroyer USS Melvin. She slowed and then blew up and broke in two sinking with all hands. This account has been contested in recent years but many find the new version less believable than the first. Key in the evidence was the rescue and capture of Yamashiro’s Executive Officer in the north end of the strait and the surviving logs of the other Japanese ships which reported the sinking. 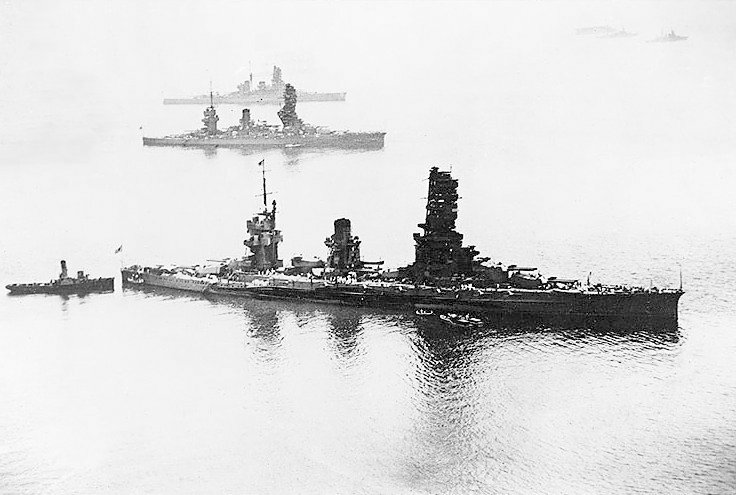 Yamashiro though hit continued north with Mogami and the last destroyer Shigure. At 0353 West Virginia opened fire and score hits on her first salvo. She was joined by California and Tennessee at 0355, the other battleships with their Mark 3 fire direction radars were slow to open up. Maryland got off six full salvoes by ranging in on the splashes of West Virginia, California and Tennessee. Mississippi logged the final salvo of the battle and Pennsylvania got no shots off. West Virginia fired 16 salvoes, 96 round of 16”armor piercing shells, Tennessee got off 69 rounds and California 63 of 14” armor piercing, Maryland added forty eight 16” rounds.